I've had this dress sitting in my closet for three weeks before I finally worked up the confidence to wear it this past weekend. It seems a little silly considering it's really not that different than the dresses I usually wear, but in a weird way, it represented an insecurity of mine. 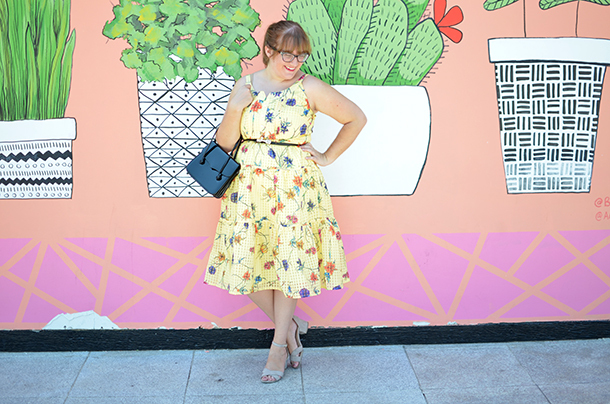 The dress is by Voodoo Vixen, one of the brands that pinup bloggers wear that I usually can't afford. It was a fraction of the usual price on Zulily last month, and I decided to try it out. Other than too long straps (a common short girl issue of mine that I usually fix with some janky safety pin work), it fits great and is absolutely beautiful. So why was I afraid to wear it? 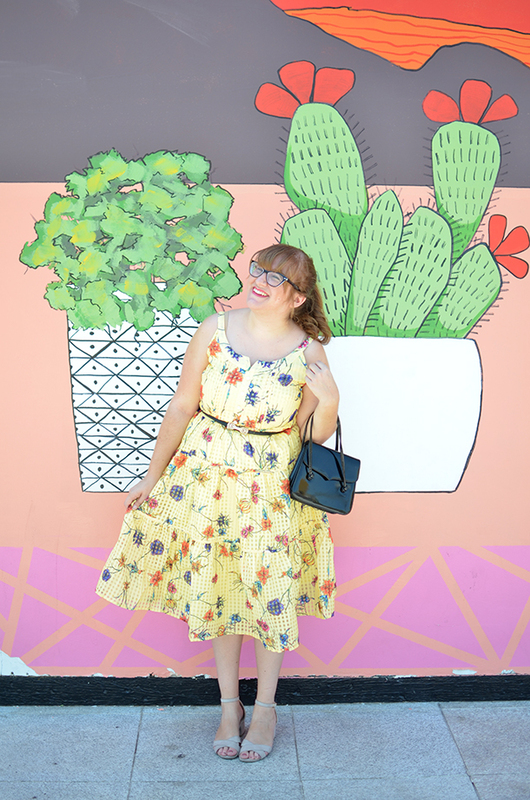 As I follow more and more pinup and vintage bloggers, it's only natural that my style would start to shift that way. 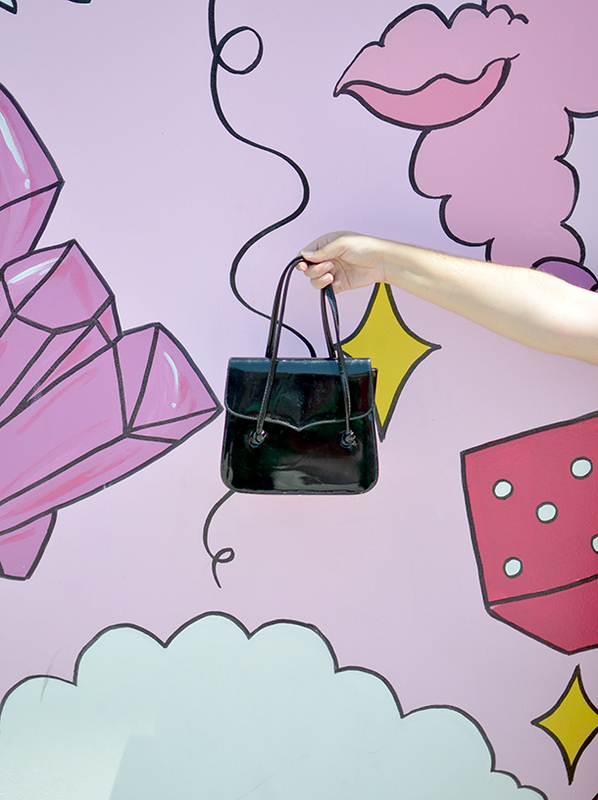 Until now, though, I've stayed away from brands like Pinup Girl and Bernie Dexter, and I've only recently started finding out that I could afford things from brands like Lindy Bop and Collectif. I've been incorporating some of the styles I always see into my wardrobe, but I've yet to go full pinup. I'm not necessarily sure if I want to, but I've been nervous that once I start shopping with more these brands and going full out with the styles, I would lose my identity in a way. Don't get me wrong, I LOVE the girls on Instagram who I see wearing these items. There's a reason why I follow so many. That said, I've been worried that if I did too, I would come across as trying too hard to be like them and I'd just end up looking like everyone else. That's not even to mention that I've always felt that pinup style came with an amount of confidence that I just have never felt like I possess. The hair, the poses, the way they look like they can command a room...that's just not me. I don't think there's a way for those insecurities to ever fully go away, at least not overnight, but I'm proud to say that even though I still worry about what people think (it's almost impossible not to in this Instagram age), I still bought and wore the dress. And you know what? I felt damn good in it. Sure, it's not the most pinup item I could try and it's really not too different from my other dresses, but it's a step in that direction. Maybe I'll invest in a petticoat and a sweetheart top, maybe I won't. Either way, I'm still taking baby steps to figure out what I really like vs. what is trendy, and wearing what I want regardless of my insecurities. I know I've mentioned this thought process of mine before, and if you read regularly, it's possible that this is a little redundant. I suppose this is more of a "style journey update" of sorts. There's probably a lot more to be said regarding what Instagram does to our self esteem, but that's a longer post for another day. For now, I'm excited to see how my style evolves. I almost forgot the most important part of this post! I finally visited the Gardenwalk (even though it's less than 10 minutes from me) to take pictures in front of the painted walls there. This succulent wall was my absolute favorite, and I will definitely be going back to take pictures in front of some of the others. I love this dress on you and I don't think that wearing a slightly vintage inspired brand will change you! The pin-up look is super trendy and elaborate and while it's cool, I just don't see you converting to full face of intense makeup, petticoats, and super high heels. To me, that's what makes the pin-up look pin-up and I think you doing your own take on it is really great and certainly you. This was truly such an interesting read and I want to dig into your thought-provoking content, but first gotta say- you look lovely. This is a pretty color on you and not one everybody can pull off. It is so interesting that in this same breath you are saying that you are worried you can't pull off the Pin-Up look but think you might want to try it.... and are also saying that you also worry that if you did try the pin-up girl look, that you might lose some of your identity or have it obscured by the culture/look/stereotypes of the pin-up subculture? Oh, Instagram! I totally get feeling insecure about opposite things like this! First, I think you can have items from these brands and wear them in totally pin-up, faithfully retro ways. But I *also* think you can use these same pieces and wear them in more timeless ways, or in updated ways. Quite frankly, I can picture several ways that are very much your style -a skirt from any of the brands you mentioned paired with one of your peter pan collar tops? or Cardigan and a dress? Great combos! Maybe I only think that since I tend to wear my own items from those brands that way.... I type while wearing a chunky sweater and a Pin Up Girl Clothing skirt.... Besides, sometimes its fun to play with style and you be an extreme version of something one day, a mild version of something else another, etc. etc. Anyway, TL;DR the point is- you are amazing and could pull off whatever you wanted and that is because you do try new things even when you are insecure and you have a sense of humor about you that keeps things from getting to serious. Love this post! 1. This dress is perfect on you. I agree with Kristian that this is a color a lot of people shy away from, but you knock it out of the park! 2. I totally know what you mean about not wanting to lose your identity in a certain style! Anytime I start focusing my shopping on a certain store, I have to work to incorporate other pieces into my outfits so I don't look like a walking ad for the retailer. 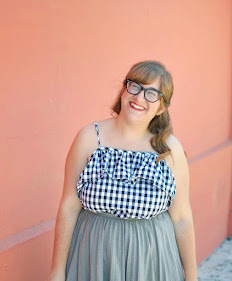 Plus, it's just more my style to mix things - Madewell meets ModCloth, J.Crew with a vintage touch, etc. 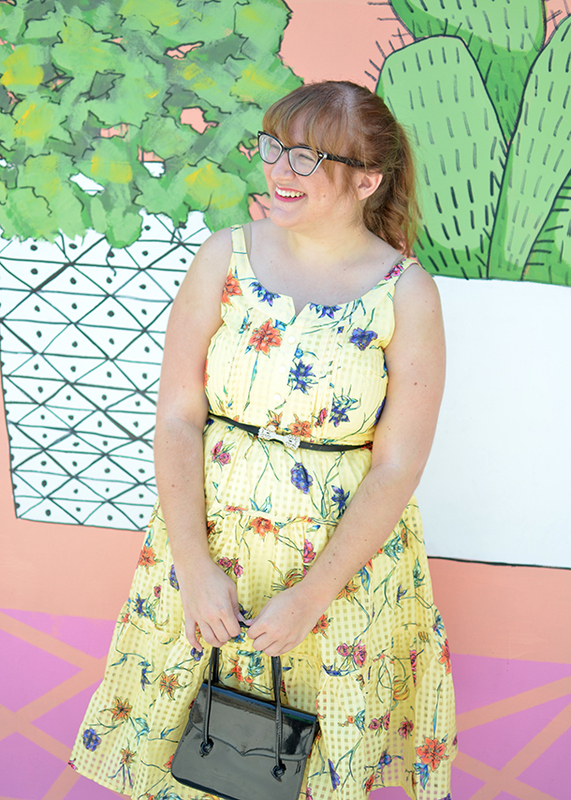 If you wanted to go full pin-up, I think you'd look amazing, but I'm also super glad you're staying true to what you love (which includes lots of things!) and continuing to dress like you. I completely understand what you mean. I have a petticoat, but I can never bring myself to wear it. Will people think that I think I look like a pinup?! (I don't and won't look like one) What if someone thinks I'm overdressed?!! (I will be.) I struggle between wanting to look cute, but not wanting the extra attention I will inevitably get when I do. I was amazed to read that you felt a bit nervous about wearing this dress because it looks totally you! I guess I get what you mean, if I dress "too" anything, I worry about looking like a poser (which you do not!) More and more, instead of following trends or "rules", I'm really just trying to buy and wear what I like. Glad you bought and wore this dress because YOU like it. Also love this mural. One of the great things about growing old is that you don't worry about these kind of things anymore. You being you without worrying about how it will be perceived takes time to get used to but is well worth it in the end. Challenging yourself to something that might push you out of your comfort zone is the best way to continue to grow. This is my first time visiting your blog, I came from Kristian's blog. 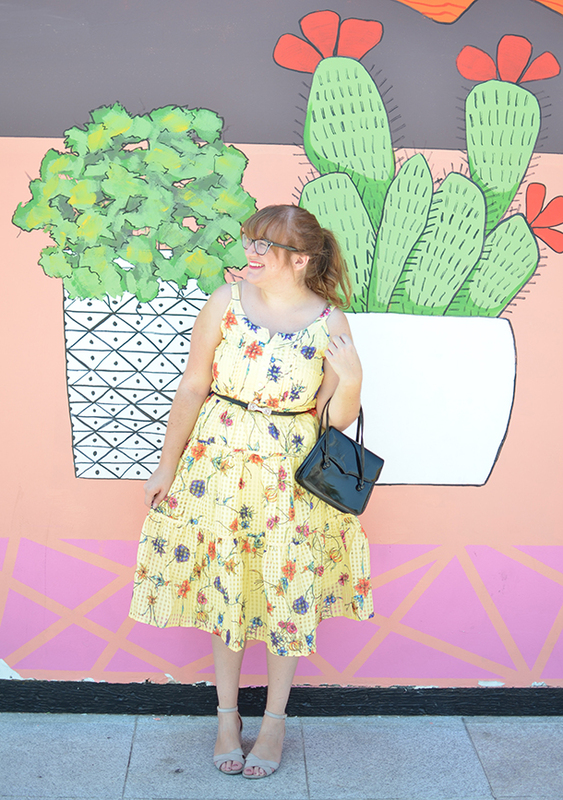 I'm also an avid thrifter and vintage lover.